Now, in the title of this post, I’m not necessarily referring to Gonzaga’s high rank (13th) or many of the kind words written about them in national publications this preseason. Those are great. Big surprise: I wrote those things. Przemek Karnowski comes up high to set a screen for slasher Byron Welsey. 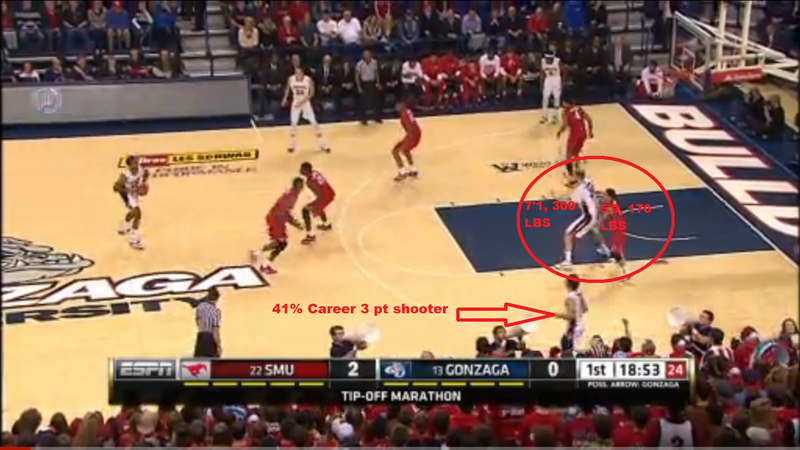 In the corners and on the wing, you have those three 40% shooters in Gary Bell, Kevin Pangos, and Kyle Wiltjer. Wesley dribbles to the top of the key, leaving tiny Nick Moore (who was covering Pangos in the corner) comically trying to cover Karnowski. Meanwhile, one of Moore’s teammates frantically tries to rotate, as Pangos sits all alone. The ball swings to Pangos for a wide open jumper, while Karnowski calls for the ball because he is also wide open. How? 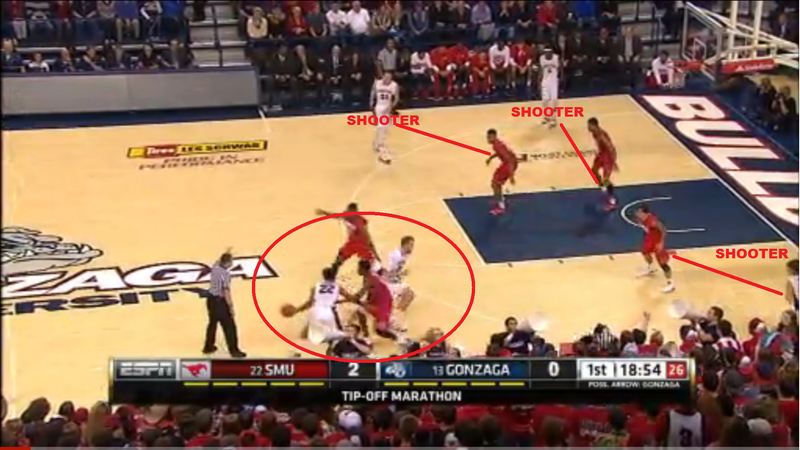 SMU needs to be concerned with Wiltjer and Bell, so there’s no help coming from the weak side. Pangos hits one of his 5 threes and the rout begins. 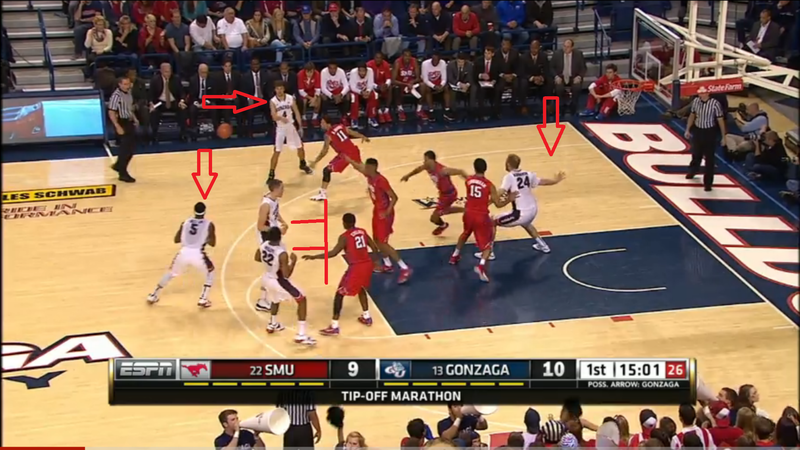 SMU was sloppy all night and couldn’t get shots to go, but you have to credit the Zags defense in many respects. Nick Moore was begging for someone else to do some scoring, but with intensity on the perimeter and rim protection from the Zag bigs, the Mustangs shot 19-61. 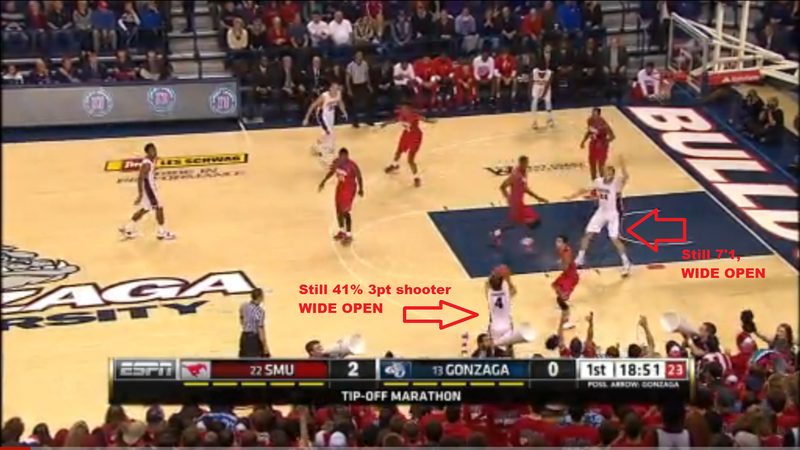 Having all the spacing and opportunities Gonzaga means nothing unless they execute. Mark Few knows how to put his players in a position to succeed. The talent on this year’s team makes that even easier. On this first half play, the Bulldogs have the ball in the hands of their best playmaker, an excellent shooter coming off of a double screen, and their post scorer sealing off a passing lane. Pangos chose to pass to Bell, who missed the shot, but Karnowski had inside position and grabbed the rebound. These are the kind of looks they’ll get when they execute excellent play designs from Few. Domantas Sabonis: Son of Hall of Famer Arvydas, the young Euro had some iffy moments in his debut but he’s big, skilled, and athletic. He made a drop step move in the second half that looked like it came from a Kevin McHale VHS demo tape. Josh Perkins: Big time PG recruit. Showed flashes of excitement in his first big minutes. A big 25+ point game is coming from him. Angel Nunez: Louisville transfer/athletic 4. He’s all over the floor. He makes mistakes, but always makes up for them with hustle. Eric McClellan: Averaged 14 points per game during his first season at Vanderbilt and becomes eligible in January. This team will go 10 deep in March. Foul trouble and any injury bug short of an epidemic shouldn’t be able to sink this team. As Mark Few has gained a reputation as a “regular season coach”, having those worries be squelched is awfully reassuring. Shane McNichol is the founder, editor, and lone contributor at PalestraBack.com. He’s sorry for writing about Gonzaga already again. He couldn’t help himself. Follow him on Twitter @OnTheShaneTrain. Apologies for the quality of some of those screenshots. I’m still working out some of the kinks and apparently, so is ESPN3.com.